A newly released U.S. Clean Tech Leadership Index makes one thing clear: New Hampshire is faring well in terms of clean technology development and adoption, but other states are catching up, and surpassing it. The Granite State dropped four spots on the Clean Edge Index, from 12th in 2015 to 16th this year. Clean Edge Inc., a West Coast-based research and advisory firm focused solely on clean technology, used 70 different indicators from three main categories (technology, policy and capital) to determine overall state rankings. Since releasing the report in 2010, New Hampshire’s ranking is “relatively consistent,” said Clean Edge Managing Director Ron Pernick. The state has placed as low as 17 and as high as 11, in 2011. The most recent drop in its ranking “has to do with other places going up,” said Pernick, who pointed to states like Iowa, South Dakota, Kansas and California, which have hit or surpassed 20 percent in-state renewable energy generation (Vermont is close, around 18 percent). “That’s one area you haven’t been expanding,” he said of New Hampshire, pointing out that the state has generated just 2 percent of non-hydro renewable energy, such as solar and biomass. New Hampshire’s Renewable Energy Standards Portfolio does set a target for utilities to generate nearly 25 percent of energy from renewables by 2025. It’s not simply setting targets or achieving them where New Hampshire is lacking. The state has not experienced jumps in clean technology development like its fellow New England states. Over the seven years, Clean Edge found that Vermont rose from 10th to second place in clean technology development, Massachusetts climbed from 18th to 6th and Maine skyrocketed from 31st to 9th. 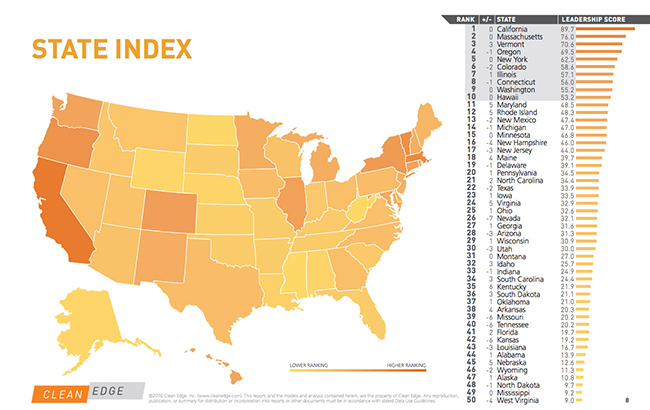 This year, New Hampshire ranked 24th. “When we started tracking seven years ago, the New England states were at a great disadvantage,” said Pernick. Since shuttering the Vermont Yankee nuclear power plant in December 2014, Vermont has seen a “huge impact” on its in-state generation mix, adding solar, said Pernick. And Massachusetts has taken an “aggressive” approach to solar, with a bill that would provide wind incentives being considered by legislators. Massachusetts ranked second, Connecticut ranked fifth, Rhode Island ranked eighth and Vermont ranked 10th in terms of policy, while New Hampshire placed 15th on the Clean Edge list. “We’ve really seen the eastern states compete and move into the top 10,” said Pernick. This year, New Hampshire raised its net metering cap from 1 percent of generation capacity, or 50 megawatts. to 100 MW. Meanwhile, Massachusetts raised its to 12 percent of generation capacity, Vermont’s remains at 15 percent and Maine has no cap at all. But New Hampshire did jump up two spots on the index when it comes to the number of electric vehicle charging stations, at 12th in the nation, and it’s seventh in terms of number of hybrid vehicles registered per 1 million people, with 18,472 hybrid vehicles registered last year. And while it lags behind in LEED-certified green building (ranking 26th), it ranks 10th in residential Environmental Protection Agency Energy Star buildings. It also ranks 11th in capital and ninth in clean energy patents granted in 2015, which is substantial, though Pernick pointed to Massachusetts as winning over venture capital investors.